Jay Ajayi walks off the field after the Eagles lost to the Vikings on Sunday in an NFC championship game rematch. When the Eagles gather in the film room Monday to inspect the wreckage of their 23-21 loss to the Vikings, they won't learn anything that they didn't already know in the locker room after the game. Sometimes the other team beats you, and sometimes you beat yourself. 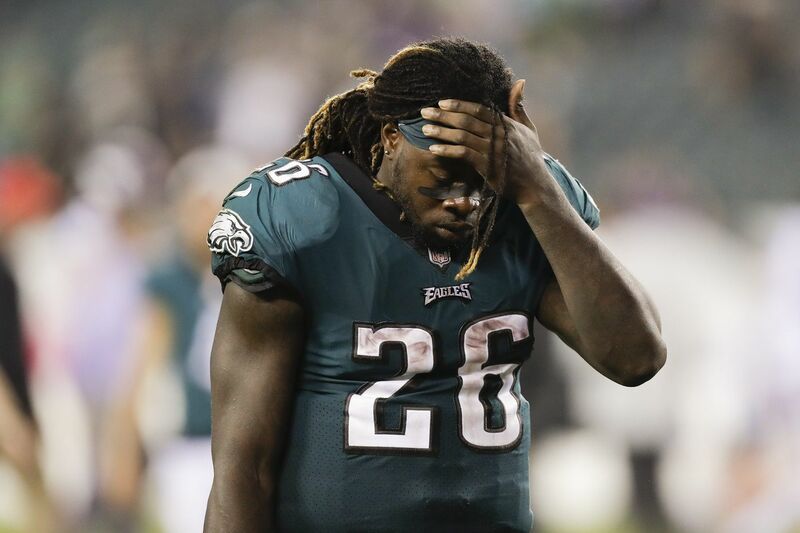 What happened Sunday at Lincoln Financial Field clearly was a case of the latter. A team that was so good in the red zone and on third down last season on the way to its first-ever Super Bowl title, suddenly has become inept at situational football. A team that didn't turn the ball over last season, lost two more fumbles Sunday, one that was returned for a touchdown and another on the Minnesota 5-yard line. A team that didn't commit stupid penalties now is making them in bunches, including a pair of false starts Sunday by two of their most respected offensive players – left tackle Jason Peters and tight end Zach Ertz – and two illegal-formation penalties. "We're shooting ourselves with penalties and turnovers that are hurting our offense,'' coach Doug Pederson said after his team lost for the third time in five games. "We seem to move the ball fine out in the field, but then [when we get into] the red zone and third down, [those] are areas that, when we're in those situations, we have to have a heightened awareness about ball security and all those things we've talked about from day one of OTAs. For the second straight week, the Eagles converted just one of four red-zone opportunities into touchdowns. Early in the second quarter, a wide-open Wendell Smallwood dropped a third-and-3 pass that would've given the Eagles a first down inside the Minnesota 5-yard line. They ended up settling for the first of two Jake Elliott field goals. On the Eagles' first possession of the second half, they drove from their 27 down to the Minnesota 6, only to come up empty, thanks to a Jay Ajayi fumble. Peters, a nine-time Pro Bowler, was flagged for a false start on a second-and-two in the second quarter. Two plays later, Ertz committed the same mistake on third-and-seven. Wide receiver Nelson Agholor replicated the same gaffe that helped get him benched two years ago, lining up wrong and drawing an illegal formation penalty on a second-and-1 in the third quarter. The Eagles, who converted just five of 15 third-down opportunities in last week's loss to Tennessee, converted just two of nine Sunday. Quarterback Carson Wentz, who led the NFL in third-down passing last year, completed just three of seven third-down passes for 40 yards and one sack. It was the fourth time he's been sacked on third down in his three starts. Last year, he was sacked on third down seven times the entire season. For the third straight game, Smallwood ran the ball well in limited opportunities. He gained 27 yards on just three carries. But his dropped red-zone pass in the second quarter potentially cost the Eagles points. They would've had a first down inside the Minnesota five. Ajayi's fumble early in the third quarter came on a first-down play from the Minnesota 6. It was the second lost fumble of the day for the Eagles, giving them a league-high seven for the season. "I can't do that,'' said Ajayi, who finished with 29 yards on eight carries. "I pride myself on being elite. I want to be elite. I want to be the best. And you can't do that when your team is counting on you. "We had a great drive to start the second half. To finish the drive, I've got to make sure I hold on to the ball and get in the end zone. I can't do that to the team. I take pride in my craft. "I'm very disappointed personally in doing that. Because I know at the end of the day, that played a part in why we lost today. I'm going to take that to heart and wear it on my sleeve and come back better from that." The Eagles are doing a lot of things they didn't do a year ago. All-Pro right tackle Lane Johnson, who gave up a costly sack last week that led to a Wentz fumble, gave up another one Sunday that resulted in not just a fumble, but a Vikings touchdown. "Those mistakes are the reasons we lose games," Johnson said. "Giving up pressures, giving up sacks, we're not accustomed to doing that around here. "All of this is going to make us take a good, long look in the mirror and reevaluate ourselves. Where are we at? What can we do better? "We still have a lot of football left. As dire as the situation is, this division isn't very pretty right now. We're in a mess. We need to keep scratching and crawling and find a way out of it." Said Ajayi: "We have to evaluate ourselves. Who do you want to be? What's your identity? Who this team is. "Everyone is comparing us to last year and what we did. But this is a different team. This is the 2018 Eagles. We have to figure out what we're doing this year and how we can get back to another Super Bowl. And we're not doing that right now."